One of the restaurants that was recommended to me in Barcelona by a few people, was Da Greco for Italian food. I wasn’t particularly thrilled to be eating Italian food in Spain, but then again, I’m always down for a good pasta dish. Usually if a place is recommended by a few people, I always want to give it a try, it must be good right? I also heard that Jay Z & Beyonce go there when in Barcelona, so that was another incentive, lol. We had our hotel call to make a reservation, and they couldn’t get through so we decided to just show up. It was the day after the terrorist attack, and a lot of restaurants and businesses shut down for a few days, so we were expecting to show up at a closed restaurant. When we showed up the door to the restaurant was locked. We stood there in defeat, bummed that we couldn’t experience it, and started to look for other dinner options on our phone. A few minutes later, a couple walked up to the door and said they had an 8:30pm reservation. We all stood there confused and perplexed, and all didn’t understand why the door was locked. Then one of us noticed there was a small buzzer to the side of the door, and pressed the button. A woman answered on the intercom, and the couple stated they had a reservation, and moments later the door opened with the hostess greeting us. I told them we didn’t have a reservation, but they gladly and very enthusiastically sat us right away. 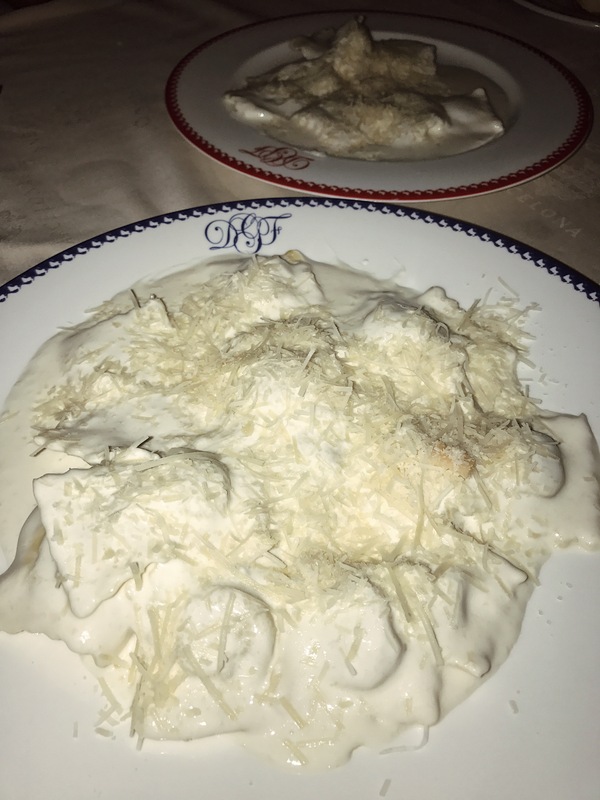 I went with two other people, and we decided to order what they’re known for- pasta. We ordered a variety all their most popular pasta dishes on the menu, along with a shrimp scampi as an appetizer. Would I say it was the best Italian food I ever had? Definitely not, but it was good, and satisfied my Italian food craving. The white truffle ravioli was my favorite, and then the creamy pesto ravioli. The shrimp scampi as an appetizer was delicious too! A lot of pasta dishes are very creamy and rich so be prepared for a heavy meal. Either way, a great option when in Barcelona!